In News, Numbers and Public Opinion in a Data-Driven World, An Nguyen brings together contributors to showcase international research on the integration of statistical reasoning in journalistic education, production and consumption. In a data-driven context marked by concerns about fake news, “post-truth” and the spread of disinformation, this is a thoughtful and accessible contribution to understanding the role of numeracy in contemporary journalism, recommends Sabrina Wilkinson. News, Numbers and Public Opinion in a Data-Driven World. An Nguyen (ed.). Bloomsbury. 2018. In 1954, Darrell Huff published How to Lie with Statistics, a tongue-in-cheek guide for those wanting to use numbers to deceive. The book, now widely distributed to first-year university statistics students, outlines how statistics can confuse and muddle both writers and readers. The upshot? Huff suggests that: “without writers who use the words with honesty and understanding and readers who know what they mean, the result can only be semantic nonsense” (8). More than 60 years later, during a period rife with concerns about disinformation and fake news, these words still ring true, making An Nguyen’s edited collection, News, Numbers and Public Opinion in a Data-Driven World, a timely contribution. A former journalist and veteran in this field of study, Nguyen’s edited volume showcases international research on the integration of statistical reasoning in journalistic education, production and consumption. Bringing together perspectives from journalism, public relations, communication, mathematics and statistics, the collection offers a lively dialogue across disciplines that have often kept each other at arm’s length. In doing so, the text bridges the often seemingly insurmountable qualitative and quantitative divide, providing readers with an understanding of what robust and thoughtful statistical reasoning can offer journalism, and vice-versa. As these two worlds converge in the newsroom and elsewhere, this integration is a useful and important one that will prove particularly instructive to journalism students, journalists, scholars and anyone else interested in the implications of data for contemporary news media. Starting from the classroom, essays in this collection trace the path (or lack thereof) of statistical reasoning between journalistic education and practice. Robert J. Griffin and Sharon Dunwoody’s survey of journalism departmental chairs on the prevalence, amongst other metrics, of statistical reasoning in journalism departments across the US provides especially instructive insights. Amongst their findings, the authors determine that while chairs support these skills in principle, the actual provision of such courses is left wanting. As other chapters lay out, given the evidence in support of sound statistical reasoning in journalistic practice stacked against the (sometimes embarrassing) errors made by those practising the craft without this skillset, this conclusion is one of the book’s key takeaways. 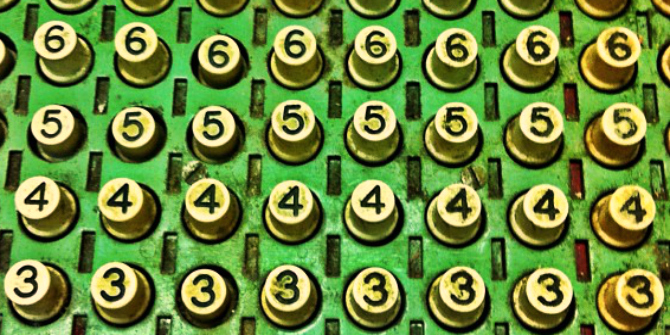 Image credit: Up Close With Numbers by Jenni C. This work is licensed under a CC BY 2.0 license. Other contributors comment on the chief challenges to incorporating numbers into the news media, as well as the consequences of doing it poorly. Kevin McConway highlights the stereotypes and misunderstandings that have sometimes characterised the domains of statistics and journalism, concluding with some much-needed practical advice for statisticians on how to work with journalists. In short, this involves understanding journalistic practice, including deadlines and agendas, as well as getting comfortable with the fine balance between the personal nature of news stories and the integration of generalisable statistical findings. The author concludes with this call to arms: “[statisticians] need to be proactive in making known to journalists what we do, and why we do it” (223). And certainly, this book provides no shortage of examples where numeracy is found wanting in recent news coverage. Fabienne Crettaz von Roten points out common misuses of statistics in the news media, including misleading visual representations, incomparable data sets and the misapplication of statistical terminology. Most sobering is Muhammad Idrees Ahmad’s commentary on the consequences of statistical errors in journalism, which finds that “credulous news coverage in a docile press, especially with the way that dubious drone-related statistics were employed, helped to legitimize the drone war” (48). While the consequences of journalistic innumeracy can range from the minute to the grave, all play a role in how the public understands the world and some, as in Ahmad’s contribution, in the ways that significant political decisions are made. 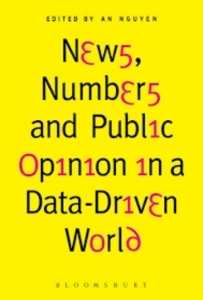 Alongside informing the reader of key issues surrounding the increasing role of numbers in journalism, Nguyen’s collection also provides comments on just how data is used in news production today. Amongst the findings offered in Julius Reimer and Weibke Loosen’s study of data journalism pieces nominated for a Digital Journalism Award are that newspapers make up the largest group of nominees and that nearly one-half of nominees examined a topic political in nature. Nguyen and Tien Vu analyse the rise of audience metrics, identifying the variety of risks they pose to modern newsmakers, not least in the push for more clicks. To mitigate these challenges, the authors conclude with a proposal for an audience data philosophy built on a foundation of inclusion, public service and specialist knowledge. Where Nguyen’s collection might have gone further would have been through a greater focus on the ethical implications of a data-driven news media. To be sure, contributions address issues including data transparency, algorithmic bias and research ethics; however, if the recent Cambridge Analytica breach tells us anything, it is that personal data is being collected at a far greater magnitude that most of us can understand. Journalists today can access troves of data about the public, particularly in comparison to the time of writing of How to Lie with Statistics. This is undoubtedly exciting for the news industry, but it too poses the question: alongside sound numerical skills, what new responsibilities should this wealth of data require journalists to hold? One related quandary is whether it is ethical for journalists to publish stolen data. An example of this dilemma is found in the Ashley Madison database hack, which resulted in more than 25 gigabytes of private user data being dumped online. While news sources were tentative to link directly to the searchable databases that were quickly made available to those interested, numerical reports on the demographics of those who used the platform were readily available from reputable news sources as were guidelines on how to access the data. A second concern is how journalists should protect sensitive data from the likes of interested government officials, members of law enforcement and other groups. In 2012, Wired columnist Mat Honan had the contents of his Macbook, iPhone and iPad erased by hackers. There are numerous other examples where data in the possession of journalists has been stolen for malicious intent. While it’s unclear what the solution to these challenges and others like them might be, it is worth emphasising that a data-driven world opens a Pandora’s box of ethical problems — many that go beyond existing industry standards and guidelines. While most of these difficulties far surpass the scope of Nguyen’s collection, they are important considerations in the discussion about numeracy in contemporary journalism. And, indeed, this is a dialogue to which News, Numbers and Public Opinion in a Data-Driven World offers a thoughtful and accessible contribution. Sabrina Wilkinson is a PhD student in Media and Communications at Goldsmiths, University of London. Her dissertation focuses on the politics of internet policy, while her MA (Carleton University) research examined the state of the news media in Canada.